It wasn't long ago when many scholars were questioning the actual existence of a Roman Governor with the name Pontius Pilate, the procurator who ordered Jesus' crucifixion. In June 1961 Italian archaeologists led by Dr. Frova were excavating an ancient Roman amphitheatre near Caesarea-on-the-Sea (Maritima) and uncovered this interesting limestone block. 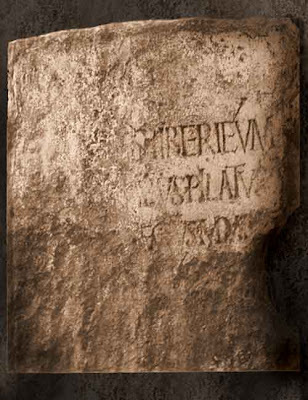 On the face is a monumental inscription which is part of a larger dedication to Tiberius Caesar which clearly says that it was from "Pontius Pilate, Prefect of Judea." This is the only known occurrence of the name Pontius Pilate in any ancient inscription. Visitors to Caesarea's theater today see a replica, the original is in the Israel Museum in Jerusalem. It is interesting as well that there have been a few bronze coins found that were struck from 29-32 AD by Pontius Pilate.